The U.S. added roughly 287,000 jobs in June 2016, exceeding most economists’ expectations. This was the highest monthly growth in jobs since October 2015 and it eased many people’s concerns that the labor market was slowing. Despite the boost in the number of employment opportunities, however, economic conditions in the country aren’t exactly rosy. The Federal Reserve’s new Labor Market Conditions Index – which it uses to measure fluctuations in the jobs market – remained negative for the month of June. This is SmartAsset’s second annual study of the best cities for career opportunities. Read the 2015 study here. A strong economy and a healthy labor market are essential for individuals trying to re-enter the workforce or switch jobs. When unemployment is low and job growth is steady, it’s generally easier to make career moves. Try SmartAsset’s free retirement calculator. Head to Utah. For the second year in a row, the state has the highest number of cities in the top 10 on our list of the best places for career opportunities. 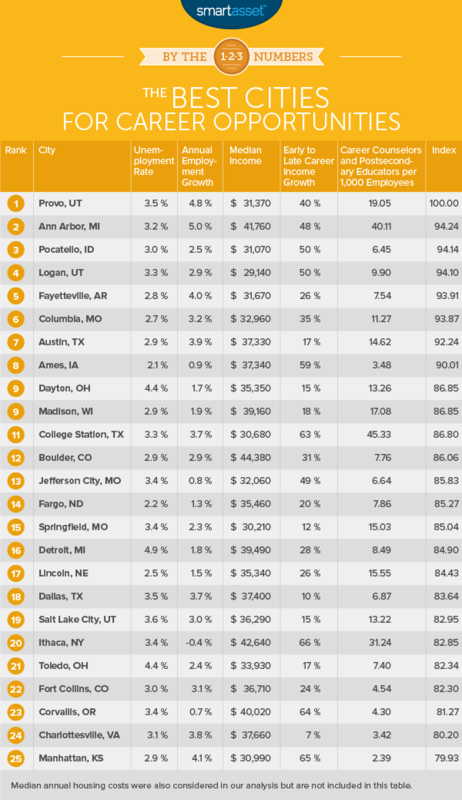 Both Provo and Logan ranked well in our 2015 analysis. Move to Missouri… or Texas. The Show-Me State and the Lone Star State are the only other states in our study (besides Utah) with three cities ranking in the top 25. There are a number of reasons why the jobs market in Provo, Utah is hot. In addition to keeping its unemployment rate low (recent numbers have it at 3.5%), the metro area has plenty of opportunities for tech workers and individuals in the retail and manufacturing industries. Plus, Provo has a low cost of living. It ranks as the most affordable place for renters in 2016 and the typical resident in Provo pays just $9,696 a year for housing costs. Employees in Provo enjoy super high-speed internet, thanks to Google Fiber. And those who stick around and climb the ladder until they’re ready to retire can expect to have late-career salaries that are 40.1% higher, on average, than their early-career salaries. Ann Arbor is a great place to live if you’re looking for a new job. Between 2015 and 2016, the number of jobs in the area increased by 5%. That’s the third fastest rate of annual employment growth in our study. If you need to expand your skill set or find a counselor to help you map out your career path, that’ll likely be relatively easy. The number of vocational counselors and postsecondary teachers per 1,000 employees is 40.1. That’s relatively high compared to the availability of professional advice and education in most of the other cities in our analysis. Pocatello is another area with a low unemployment rate and a low cost of living. The area is a small city that’s located nearly 200 miles from Boise in eastern Idaho. Some of the region’s top employers include Idaho State University, the Portneuf Medical Center and Union Pacific Railroad. Although it’s fallen slightly in the rankings since 2015, Logan, Utah still has a strong labor market. It’s unemployment rate remains at 3.3%, according to May 2016 data from the Bureau of Labor Statistics. The median income for workers in Logan is $29,140. That means that homeowners spend roughly 28.6% of their salaries on housing-related expenses each year. That’s below the Department of Housing and Urban Development’s 30% threshold that’s used to determine whether housing is affordable. Fayetteville, Arkansas has a population of roughly 77,264 people. Job seekers can find career opportunities in fields such as healthcare, education and manufacturing. Since 2015, the number of jobs in the area has increased by 4%. Columbia is a college town through and through, mainly because it’s home to the University of Missouri as well as Columbia College and Stephens College. Even if you’re not interested in working with students, launching a career in the area shouldn’t be too difficult. Unemployment is quite low (2.7%) and the oldest workers have salaries that are 34.8% higher than early-career salaries. Compared to other major cities in Texas, like Dallas (which ranks 18th) and Houston (which ranks 203rd on our list), Austin has fewer unemployed people and has added more jobs in the past year. Between 2015 and 2016, the number of jobs in Austin rose by 3.9%. Austin can be a great place for recent graduates who are trying to enter the workforce. Job prospects are likely good for folks interested in working for the government, a public school system or a tech company, as these are popular industries in the city. Out of the top 25 best cities for career opportunities, Ames, Iowa has the lowest unemployment rate (2.1%). The city’s median income is $37,340 and employees who spend their entire careers in Ames can expect to have late-career salaries that are 59% higher than the salaries they receive earlier on in their careers. Dayton is Ohio’s sixth largest city. Inventors of things such as the movie projector, the cash register and the parachute grew up there. Even if you don’t have what it takes to create a new product, you’ll likely find that Dayton is a good place to find a job or launch a career. If you’ve never thought about moving to Madison, perhaps you should. Its unemployment rate is much lower than it was when we conducted our 2015 analysis of the best cities for career opportunities. Between May 2015 and May 2016, the city added about 45,900 jobs to its private sector and had an overall annual employment growth rate of 1.9%. Mad City is a college town. Students looking to earn degrees in the area have several schools to choose from, including the University of Wisconsin-Madison and Drew University. Madison also ranks as the fourth least-stressed city in America in the 2016 edition of the study. That could be good news for someone interested in getting out of a high-stress environment. 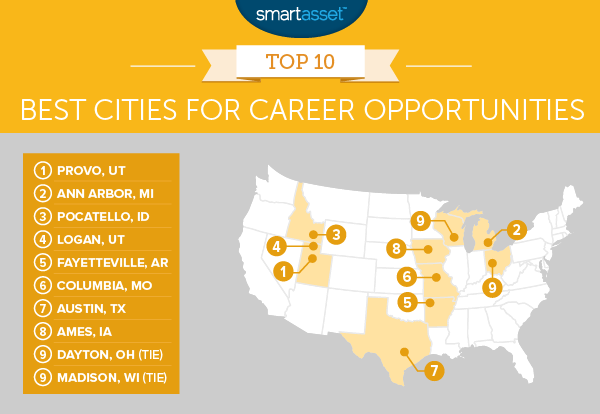 SmartAsset used seven factors to rank the best U.S. cities for career opportunities. In all, we included 355 of the largest metros in our study. To get a sense of the labor market conditions in each metro area, we looked at the unemployment rate and the rate of employment growth. We also looked at the median income in each metro and took cost of living into account by pulling median annual housing costs. Next, we found the growth in average wages from the early-career stage (for workers ages 25-44) to the late-career stage (for workers ages 45-64). Finally, we considered whether employees had the opportunity to gain additional skills and training by finding the number of postsecondary teachers and career counselors per 1,000 employees. After we ranked each metro area across all seven of our metrics, we averaged those rankings, giving full weight to most of our metrics and half-weight to the three remaining factors (income growth and the number of postsecondary educators and vocational counselors). Each metro received a score between 0 and 100. The best ranking city scored a 100 while the worst ranking city scored a 0. Data on the rate of employment growth, the unemployment rate, the number of counselors and postsecondary instructors and median income comes from the Bureau of Labor Statistics. Data on the growth in early-to-late career wages and median annual housing costs comes from the U.S. Census Bureau.